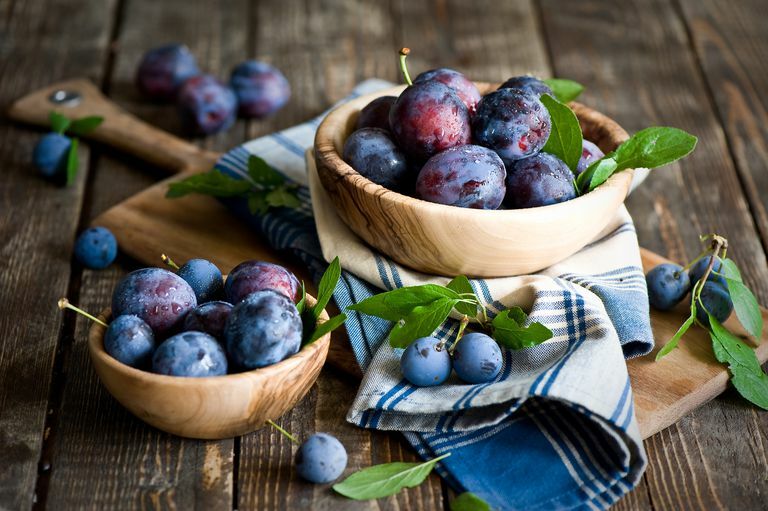 Plums are a less-concentrated, lower-calorie form of prunes, which are commonly used to prevent and treat constipation because of their fiber content. A single plum has only about 30 calories, so it makes a great grab-and-go snack. Plums can be a healthy and delicious addition to your weekly meal plan. One medium plum contains about eight grams of carbohydrates. There are just over six grams of naturally-occurring sugar and almost one gram of fiber in each plum. Plums are a low-fat food, with less than one gram of fat per serving. There is about one-half of a gram of protein in a plum. It is not a rich source of protein. Plums are not a significant source of vitamins and minerals. However, you will get about 6.3 mg of vitamin C, or about ten percent of your daily recommended intake. The vitamin C in a plum provides certain health benefits. Vitamin C is an important water-soluble vitamin that is responsible for repairing cells, boosting immunity and slowing down the aging process. Plums also contain soluble fiber, which is known for being cardio-protective and helpful in reducing bad cholesterol. In addition, plums contain, phytonutrients, particularly phenols, which have antioxidant effects. Fresh plums are available from June through October since their peak season is August and September. Are there different varieties of plums? What about different plum colors? Plums come in a whole rainbow of colors, from almost-black, through purple and blue to green, red, and yellow. There is even a species that remains green when ripe (greengage plums). They vary in size from very small to three inches in diameter. Dozens of varieties are known, but only a few are available for purchase. What is the difference between a plum and a prune? Prunes are produced by drying special plum varieties, usually the French Agen. Interestingly, all prunes are plums, but not all plums are prunes. Research has shown that many people respond better to the name "dried plums" rather than "prune," therefore you'll often hear prunes being referred to as dried plums. California grows 99 percent of the U.S. supply of dried plums. Sugar plums are not sugar-coated plums, rather, a small round candy of flavored boiled sugar. When you select plums in the produce section of your market, look for fruit that is free of nicks and blemishes. They should be even in color, appear to be plump and smell sweet. Avoid purchasing plums that are rock-hard. These plums may never fully develop the rich juiciness of a fully ripe plum. Instead, pick plums that are slightly soft and give a little to the touch. If your plums are slightly hard, you can keep them at room temperature in a paper bag to continue to ripen (about one to two days), but once they are slightly soft at the end, you'll want to put them in the refrigerator to prevent them from over-ripening. Fresh plums can keep in the refrigerator for about two to three days. Before you consume your plums, you'll probably want to clean them. Plums often contain a white residue on the outside, similar looking to powder, which is referred to as "bloom." You'll most likely recall seeing this on grapes too. Bloom is a good sign because it acts as a natural protector during handling. Before consumption, it is important to rinse plums, but eating the bloom is not harmful. Plums can be frozen in freezer bags, either whole or cut up. They'll typically keep in the freezer for about 12 months. You can also store plums in the freezer as "plum sauce." Cook the plums down until the plum sauce is as thick as you like and freeze them in small, sealable containers. Plums are great to eat on their own. They also hold up well to a variety of cooking methods. Plums can be baked, grilled, poached, and used in making desserts, such as pies, cobblers or tarts. Plums are often used to make jams, preserves or sauces for meats and other cuisines. If you are looking to add color and flavor to your salad, slice up some plums and place them on top. Or chop up some plums to make a spicy salsa. Some people develop allergies to plums. In particular, people with birch-pollen allergies may also have a reaction to raw plum due to a protein in the fruit that is similar to birch pollen. Cooking destroys the protein, so many people who react to raw plums can enjoy them cooked. Sometimes plum allergies are not related to birch pollen and can be more serious. These people cannot eat cooked plums or plum juice. Symptoms typically appear 5 to 15 minutes after eating and include itching and inflammation in the mouth and throat. More serious reactions include hives, abdominal pain, and vomiting, and may be life-threatening. University of Manchester. Allergy information for: Garden plum (Prunus domestica).